I have always enjoyed the fresh feeling of a new year – the countdown and hope for something better than what has been. After going through a divorce this past year, I am ready for a fresh start. As I read things like “How to Find Healing”, or “How to Have Good Mental Health”, I constantly see that storytelling is an important part of the healing process. When we journal our thoughts and feelings, we’re using a different part of our brain than when we talk to a therapist. Being able to write our story helps us process it, and it helps us learn how to share our story with ourselves and with others. Feel free to customize this list to make it personal for you! If you want to use every question for every day, do that! Or, you can use it as a reference for those days you have writer’s block. 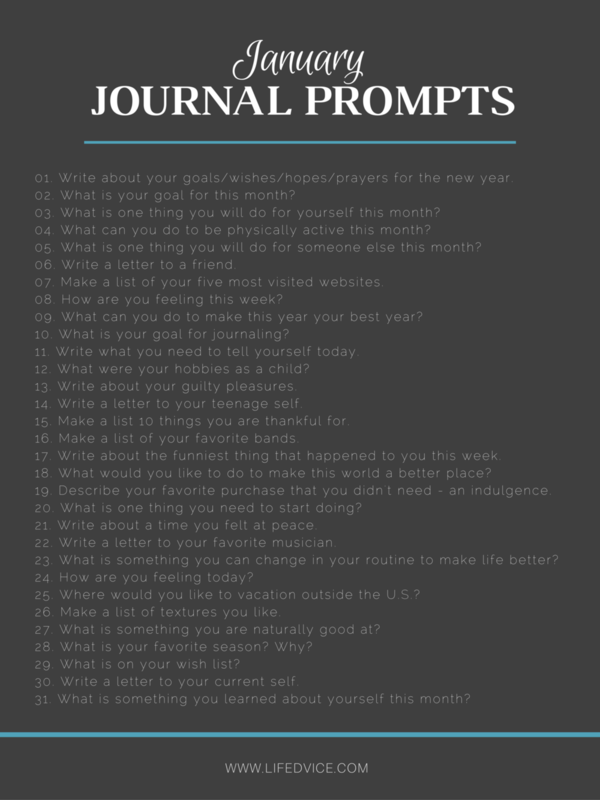 Be sure to check back the first day of every month to get the next set of prompts. To download January’s Journal Prompts in gray and blue, click here. To download January’s Journal Prompts in white, click here. Let's have 2016 be the year where we make strides toward good mental health so we can learn to live life well!